• 8 hours before you start cooking, take your navy beans and soak them in a bowl or a pan. Place the bowl or pan in the refrigerator to prevent the beans from fermenting. • Boil the beans for 2 minutes, remove from heat, cover and let stand for two hours. • In either instance remember to rinse off the beans after they have had a chance to soak. • Start by taking your beans and bringing them to a boil. Then turn the heat down to medium and allow to simmer for about 1 hour. • Slice your bacon and put it in a skillet on medium-high. Chop your onion into small cubes and stir it to the cooking bacon. Cook until the bacon and the onion starts to get nice and crispy. Turn the heat down to low-medium and add in your beans. Stir in the molasses, maple syrup, tomatoes, ketchup and salt & pepper to taste. • Bring the oven to 360° F (182° C). Spread your Canola oil over the bottom of a roasting pan. Smother your ribs on both sides in your homemade BBQ sauce and place the ribs in the roasting pan. Place in the oven, a lid is not necessary. Since you have already boiled the ribs a bit, give them 30 minutes and check on them. • Take your cabbage and slice into nice long julienne slices. Once they are cut, place the cabbage in a large bowl and soak in the apple cider vinegar for at least 20 minutes. • When the 20 minutes (Or however long you like. Art suggests not going over 90 minutes) is up, strain the cabbage from the apple cider vinegar. Add in mayonnaise and sour cream. If you have access to fireweed this is the time to add in sliced fireweed shoots. If you don’t have fireweed, try using nodding onion as a garnish for the coleslaw. 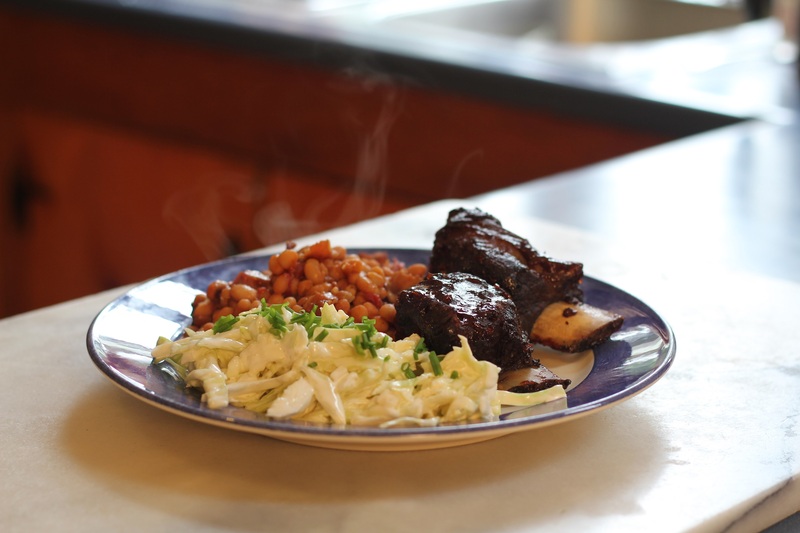 • Dish out a healthy mound of coleslaw, accompanied by lots of beans and a couple of bison ribs. Sprinkle sliced nodding onion on top of the coleslaw.